Blaze has once again teamed up with Dr. Rachel Aldred, Senior Lecturer in Transport at the University of Westminster, to bring back the Near Miss Project, a study researching ‘near misses’: cycling incidents that don’t result in injuries. Registration for the project is open now and runs until the 1st November and is looking to recruit 2,000 cyclists from the United Kingdom. 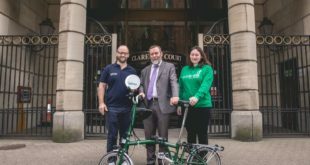 Participants will be asked to complete an online diary, sharing experiences from their cycle trips and whether they have had any near miss experiences. Cyclists wishing to sign up to take part in the Near Miss Project’s second study can find out more information and register interest on www.nearmiss.bike. The project doesn’t seem like slowing down either, with plans already underway to take it global, with cross country comparisons potentially proving to be invaluable when analysing near misses and experiences, all of which hope to make cycling safer for everyone. Recommendations taken from the most recent study are set to be presented in parliament towards the end of 2015.